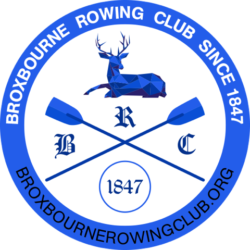 Welcome to the Broxbourne Rowing Club website! We are friendly rowing club with a fine fleet of boats, a fully equipped gym, and a modern, spacious club house with a bar. We row pretty much undisturbed on a delightful stretch of the river Lea. We compete vigorously and successfully in local and national races and welcome all including senior, masters, beginners, juniors and recreational rowers. If you haven’t rowed before, the sport provides full-body outdoor fitness, stimulates your senses and challenges you physically. There are few things as exhilarating as rowing at full pressure in a well synchronised crew. We run regular Learn to Row courses for juniors and adults to set you on your way. If you are a more experienced rower, you will find a racing crew to meet your aspirations, whether you want to compete at Henley, in the masters world championships, or national and provincial races. Some prefer to enjoy recreational rowing and our touring boats travel far and wide on long weekends away, or compete in pageant-spectaculars like the Great River Race. We also welcome aspiring and experienced coaches and coxes. These vital members of the club have the opportunity to make a real difference to the crew. Inexperienced or new coxes will receive support, training and coaching and are unlikely to be short of crews to practice with! If you are interested please get in touch with the club. Yep. I can swap sides. Not a problem.